Henry Wadsworth Longfellow was born February 27, 1807, in Portland, Maine. Portland was a seaport, and this gave its citizens a breadth of view lacking in the more insular New England towns. The variety of people and the activity of the harbors stirred the mind of the boy and gave him a curiosity about life beyond his own immediate experience. He was sent to school when he was only three years old. When he was six, the following report of him was received at home: "Master Henry Longfellow is one of the best boys we have in school. He spells and reads very well. He can also add and multiply numbers. His conduct last quarter was very correct and amiable." From the beginning, it was evident that this boy was to be drawn to writing and the sound of words. His mother read aloud to him and his brothers and sisters the high romance of Ossian, the legendary Gaelic hero. Cervantes' 'Don Quixote' was a favorite among the books he read. But the book which influenced him most was Washington Irving's 'Sketch Book'. Irving was another American author for whom the native legend and landscape were sources of inspiration. "Every reader has his first book," wrote Longfellow later. "I mean to say, one book among all others which in early youth first fascinates his imagination, and at once excites and satisfies the desires of his mind. To me, the first book was the 'Sketch Book' of Washington Irving." Longfellow's father was eager to have his son become a lawyer. But when Henry was a senior at Bowdoin College at 19, the college established a chair of modern languages. The recent graduate was asked to become the first professor, with the understanding that he should be given a period of time in which to travel and study in Europe. In 1834, he was appointed to a professorship at Harvard and once more set out for Europe by way of preparation. This time his young wife accompanied him. The journey ended in tragedy. In Rotterdam, his wife died, and Longfellow came alone to Cambridge and the new professorship. The lonely [Longfellow] took a room at historic Craigie House, an old house overlooking the Charles River. It was owned by Mrs. Craigie, an eccentric woman who kept much to herself and was somewhat scornful of the young men to whom she let rooms. But she read widely and well, and her library contained complete sets of Voltaire and other French masters. Longfellow entered the beautiful old elm-encircled house as a lodger, not knowing that this was to be his home for the rest of his life. In time, it passed into the possession of Nathan Appleton. Seven years after he came to Cambridge, Longfellow married Frances Appleton, daughter of Nathan Appleton, and Craigie House was given to the Longfellows as a wedding gift. Meantime, in the seven intervening years, he remained a rather romantic figure in Cambridge, with his flowing hair and his yellow gloves and flowered waistcoats. He worked, however, with great determination and industry, publishing 'Hyperion', a prose romance that foreshadowed his love for Frances Appleton, and 'Voices of the Night', his first book of poems. He journeyed again to Europe, wrote 'The Spanish Student', and took his stand with the abolitionists, returning to be married in 1843. The marriage was a happy one, and the Longfellow house became the center of life in the University town. The old Craigie House was a shrine of hospitality and gracious living. The young people of Cambridge flocked there to play with the five Longfellow children - two boys and the three girls whom the poet describes in 'The Children's Hour' as "grave Alice and laughing Allegra and Edith with golden hair." From his friend Nathaniel Hawthorne, Longfellow got a brief outline of a story from which he composed one of his most favorite poems, 'Evangeline'. The original story had Evangeline wandering about New England in search of her bridegroom. Longfellow extended her journey through Louisiana and the western wilderness. She finds Gabriel, at last, dying in Philadelphia. 'Evangeline' was published in 1847 and was widely acclaimed. Longfellow began to feel that his work as a teacher was a hindrance to his own writing. In 1854, he resigned from Harvard and with a great sense of freedom gave himself entirely to the joyous task of his own poetic writing. In June of that year, he began 'The Song of Hiawatha'. Henry Schoolcraft's book on Indians and several meetings with an Ojibway chief provided the background for 'Hiawatha'. The long poem begins with Gitche Matino, the Great Spirit, commanding his people to live in peace and tells how Hiawatha is born. It ends with the coming of the white man and Hiawatha's death. The publication of 'Hiawatha' caused the greatest excitement. For the first time in American literature, Indian themes gained recognition as sources of imagination, power, and originality. The appeal of 'Hiawatha' for generations of children and young people gives it an enduring place in world literature. The gracious tale of John Alden and Priscilla came next to the poet's mind, and 'The Courtship of Miles Standish' was published in 1858. It is a work which reflects the ease with which he wrote and the pleasure and enjoyment he derived from his skill. Twenty-five thousand copies were sold during the first week of its publication, and 10,000 were ordered in London on the first day of publication. In 1861, the happy life of the family came to an end. Longfellow's wife died of burns she received when packages of her children's curls, which she was sealing with matches and wax, burst into flame. 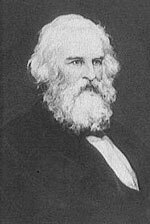 Longfellow faced the bitterest tragedy of his life. He found some solace in the task of translating Dante into English and went to Europe for a change of scene. The years following were filled with honors. He was given honorary degrees at the great universities of Oxford and Cambridge, invited to Windsor by Queen Victoria, and called by request upon the Prince of Wales. He was chosen a member of the Russian Academy of Sciences and of the Spanish Academy. When it became necessary to remove "the spreading chestnut tree" of Brattle Street, which Longfellow had written about in his 'Village Blacksmith', the children of Cambridge gave their pennies to build a chair out of the tree and gave it to Longfellow. He died on March 24, 1882. "Of all the suns of the New England morning," says Van Wyck Brooks, "he was the largest in his golden sweetness."